Very simply put, this bill is AT&T’s bid to deregulate the provision of basic telephone service, something recognized as an essential, regulated public utility service for about as long as we’ve had telephones. AT&T, Windstream and Cincinnati Bell currently provide landline telephone service in Kentucky under the watchful eye of the Public Service Commission. More than 11,000 landline customers in Kentucky’s urban areas could lose stand-alone, basic service if SB 99 were to pass. As the largest of these “carriers of last resort,” AT&T no longer wants to be regulated by the PSC in providing basic service to all who request it, as the company phases it out and moves customers into cell phones, voice-over-internet or other emerging technologies that have not proven equivalent in functionality and dependability to basic landline phone service. These 11,000 households are in “urban” exchanges. In rural areas, if SB 99 had passed, no new landlines would be required to be strung, and less dependable wireless service could be offered instead. If you moved, or requested restoration of service, the carrier would be required to provide basic service only if it had strung the lines that provided basic service in the first place, and even then only if landline service was the only feature provided. Who are the folks who use stand-alone, basic service (911, 411, operator assistance and unlimited local dialing)? They can be found in rural as well as urban areas. They are more likely to be elderly or of lesser economic means, or both. For them, basic phone service is not a luxury but a needed lifeline to the outside world. Having it can literally mean the difference between life and death in emergencies. The AARP has tirelessly advocated for this constituency, urging caution before adopting any changes that could adversely impact these individuals from the standpoint of expense and functionality. I have met with the bill’s sponsor, Sen. Paul Hornback, several times over the past two years to discuss the issue. I have consistently urged that he and AT&T consider ensuring protections for these 11,000 customers, but the most recent version of the bill did not provide those protections, and the company seems unwilling to accept any meaningful compromise. Last year the issue picked up some unfortunate political baggage when the company hired a public relations firm with Republican connections to place robo-calls to households in districts represented by Democratic lawmakers who opposed the bill. I hope I am proven wrong, but I anticipate similar tactics this year as the election season ramps up. I believe it is necessary that Kentucky modernize its telecommunications capabilities. AT&T and other telecom companies will continue to modernize because doing so is in their economic interests. The Kentucky General Assembly will contribute as well, and already has. For example, in the recently enacted budget, we provided $70 million, including $30 million in general fund bonds, for Kentucky’s build-out of the Next Generation Information Highway to increase citizen access to high-speed broadband, particularly in underserved rural areas. We additionally appropriated $1.6 million over the upcoming biennium in support of enhanced 911 services. But I also believe in supporting Kentucky’s senior citizens and working families. Promoting telecom modernization and protecting the interests of ordinary Kentuckians are not mutually exclusive, and in fact the FCC recently issued an order approving experimental trials in transitioning to Internet Protocol-enabled networks, while reaffirming the principles of universal access, affordability, reliability and competition. Our constituents are poorly served when the General Assembly passes bills that cater to the interests of large, sophisticated corporations that very often exercise their considerable influence to gain new advantages in the marketplace at the expense of those least able to bear the costs. Senate Bill 99 is that kind of bill; it’s bad for ordinary Kentuckians in its current version, and I cannot support it. I am still willing to work with the bill’s sponsors to resolve these issues, and I remain hopeful that next session we can meaningfully discuss consumer-friendly alternatives such as those adopted in other states that have considered similar bills. If these alternatives support the maintenance of basic telephone service to those for whom it is a necessity, then there is room for us to work together. 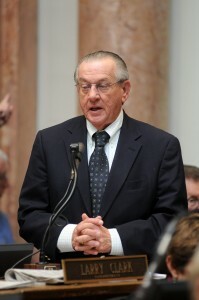 Larry Clark, D-Louisville, represents the 46th District in the Kentucky House of Representatives and is that chamber’s speaker pro tem.